Have you had enough Halloween yet? I haven't! But this one, this one is easy, cute, and will please everyone! Except the very difficult to please, they may find something wrong with them. These are really just an assembly treat. Perfect for school, the office, or just for home! Sweet and salty strikes again! I found this idea on google, maybe pinterest, not Facebook for sure, but I had to give it a try and see if they turned out as cute as they appeared or if the photos I saw were heavily edited to perfection! Verdict? Cute as EVER! These would be perfect to do with your kids, they can do the assembly and you could do the dipping. These bones remind me of a haunted house we went to when we lived in NJ. It was definitely an adult kind of scary place. When we arrived and got the instructions and rules, we were told nobody was allowed to touch us. We were with our dear friends Chip and Jami. Well, during the first house, (there were like 4) some "dead man" jumped out at my husband. My husband is tall and not a small man, the kid literally hit his head on my husbands chest and fell to the ground. HA! After he got up he asked my husband if he could "mess with me" to which my husband replied, "ABSOLUTELY". Nice guy eh? I was terrified as it was, and I could feel something in my hair. When I turned around, the dead looking guy had some kind of BONE in his hand and was sticking it in my hair. From that moment on, my husband never looked at me the same. The profanity that came from my mouth, still hangs in a cloud over "Creamy Acres". I spewed words I didn't know I knew, I was TERRIFIED. Looking back, we laugh so hard, but at the time I was terrified, mortified, and my mouth should have been washed out with bubbles. Perhaps by the "bubble man". Right Jami? Anyway, it was the best haunted house experience EVER, and I have never topped it. One day we will, Horins!! Miss you guys! Maybe you had to be there, but in that moment of being so scared, you tend to lose control.....however, as long as it isn't your bladder, we are good. Here we go. The amounts of what you need are up to you. 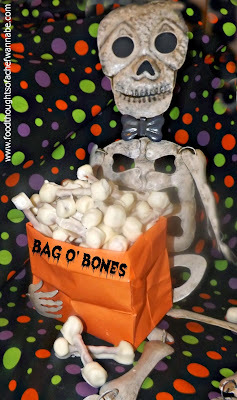 I believe with 1 bag of white chocolate chips I got about 50-60 bones! You will have PLENTY of the other ingredients for however many you want, the dipping chocolate is what you will need to plan for. Take a pretzel stick and poke a marshmallow on to each end. Make sure it is on good. Repeat until you have the amount you need. To melt your chocolate easily, microwave 30 seconds at a time until it is melted. If you want to thin it out a bit, add a cap full of veg oil to the chocolate and combine. Do this until it is a workable consistency for you. Some of you might not need any. I used 1 1/2 tbsp. Dip the bones in, and I used tongs to remove them. Let them drain well. Place on parchment lined paper and when you are all done, refrigerate for 30 minutes to harden. You can also double dip these for a stronger white color. I dipped them only one time, the next time I made them I double dipped. Double dip friends, I give you permission and in fact encourage it in this case! I hope you have fun eating bones for dessert!!! Never did bones taste so good! PS. How fun would these be for kids studying dinosaurs or bones in the body?!? Again, not just a Halloween treat!